Being British we tend to steal recipes from around the world and adapt them according to our taste, thus making many foreign dishes Britishish! (Do you like the way I just created a new word there?!). 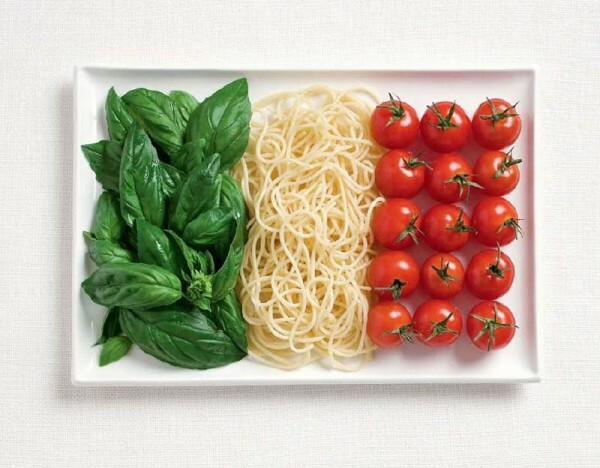 We have done this with many Italian dishes too! Take lasagne for example, we tend to make a meaty ragu and layer this between lasagne sheets and cheese sauce. Whereas the Italians use less ragu but add ‘prosciutto’ ham and mozzarella. The end result; their dish is drier and lighter than ours, and tastes completely different. So, as an expat living in Italy, a couple of friends and I decided we’d like to learn to cook like a local! We enlisted the help of Angela, whose family has lived in San Vito Dei Normanni for centuries. OK, I may have exaggerated a little there but you get the idea! Angela is very passionate about cooking seasonal dishes, using only fresh locally sourced ingredients. Most, if not all of her dishes are Pugliese, or to be more precise Sanvitese! Recipes are handed down from one generation to the next and traditions are upheld throughout the ages; the techniques, ingredients never change. However, every household has there own family recipe and therefore, this blog isn’t a step by step recipe guide but rather a ‘fly on the wall’ report on how to cook like a local. I will share with you, some of the ‘insider information’ about the typical Pugliese dishes Angela shares with us. I feel like she’s inviting us into her family by sharing her ancestor’s recipes and I’m inviting you in too! On the menu this week ‘Parmagiana’, which is slices of ‘melanzane’ (aubergines) layered with prosciutto, mozzarella, grated cheese, cooked ‘al forno’ in the oven with a tomato based sauce. As a bonus, Angela suggested we use some of the melanzane to make ‘Melanzane involtini’, aubergines with prosciutto and mozzarella rolled and secured with a cocktail stick and cooked in the oven with tomato sauce. Now, I know what you’re thinking; ‘surely they will taste exactly the same because the ingredients are almost identical’. Wrong! The Parmigiana has a much stronger flavour due to the mix of grated cheeses used and it’s a more substantial dish. It is considered a whole meal in itself because it contains vegetables, meat and cheese. 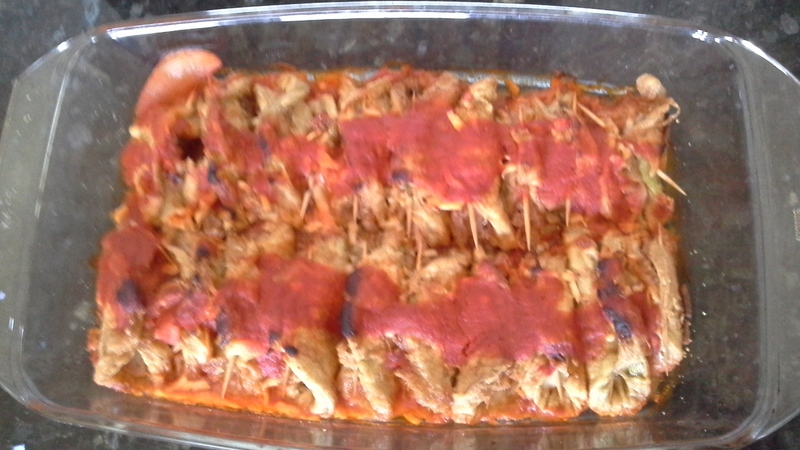 Whereas the involtini are lighter and generally eaten as a snack. 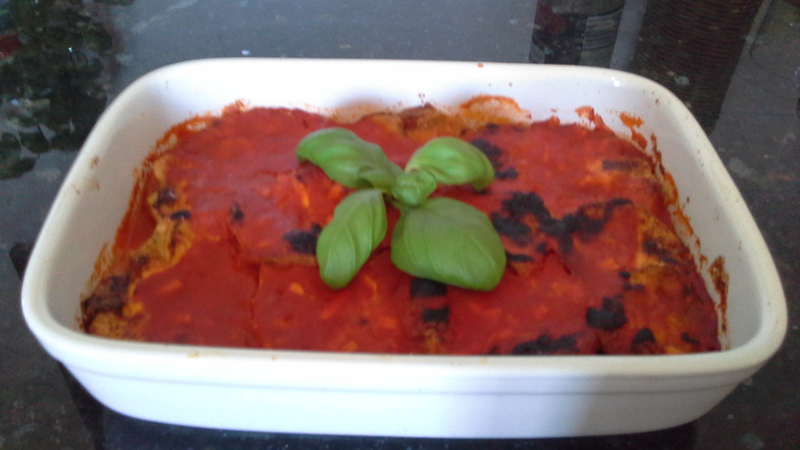 However, small pieces of Parmigiana often appear on an antipasti course as taster. One of my ‘cooking buddies’ Maria, had made Parmagiana before but Angela’s recipe was completely different to the recipe she found online, so we were all very keen to see how it’s done by a local. We began by placing half an onion in a pan with about 1mm of oil. Once it began to bubble and cook the onion, we added ‘passata’ (tomato sauce – no, not ketchup! Tomato puree). This was left to simmer for ages with a couple of leaves of basil and a pinch of salt. The next ‘top tip’ was to peel the melanzane, slice them thinly and layer them in a colander, each layer was sprinkled with just a little salt. This draws out the excess liquid. It was placed in the sink with a heavy plate on top. Later Angela returned to the colander and applied brut force to draw more liquid out. Angela told us that March wasn’t the best time of year to prepare Parmagiana because melanzane contain lots of seeds at the moment and these seeds make them very moist. “You must recreate this recipe in the summer!” she said. Next, a large quantity of sunflower oil was heated in a pan, and, when at the optimum temperature, a production line commenced. First we dipped each slice of melanzana into flour, then dipped it in the beaten egg, before being placing them the hot oil. Once golden, they were removed and put on a plate with absorbent kitchen paper to soak up any extra oil. This process was repeated until all the melanzane were cooked. Then another production line was formed! First a thin layer of the tomato sauce was used to line the bottom of a casserole dish. But, according to Angela, the sauce was too thick, so, it was watered down with, yes you’ve guessed it, water! The battered melanzana were placed on top of the sauce, followed by the prosciutto, a scattering of ripped mozzarella and grated cheese. The process was repeated, and topped off with a little sauce. Then it was ready for the oven. Simple! The involtini were just as easy to assemble. Each battered melanzane had a smidgen amount of prosciutto and mozzarella, they were rolled and secured with a cocktail stick. These were also layered over a small amount of tomato sauce and finished off with a drizzle more sauce. Ecco qua! There you go! Two local dishes ready for ‘pranzo’ lunch! ← Symbolic, Historic and Steeped in Tradition: The Holy Processions of Francavilla Fontana. Pingback: Mortar and Pesto | Alternative Sauces.